Holy deliciousness. Foodies, I don't lie. I know you're probably thinking, "watermelon and feta?" And what would you think if I told you this refreshing summer salad also includes kalamata olives and fresh mint? Crazy, I know. This delightful summer salad was featured in the Lincoln Journal-Star a couple weeks ago. It had grabbed the attention of my mom, who wanted to make it while my sister and I were both home visiting. Genius. I know this sounds like a completely odd combo - I'm not trying to persuade you to think otherwise. It is odd. But it's also very, very tasty. I promise. So please, take a chance on this salad - I know you won't regret it! Combine the first 6 ingredients (through sea salt) in a bowl - tossing gently so the watermelon pieces stay whole. Refrigerate for an hour. Before serving, add the feta, additional mint (if desired), and pepper to taste. my friend's mom sent me a recipe for something like this and i've been curious to make it bc it's such a different combo of flavors! now i think i will have to give it a try! Wow that sounds amazing! I definitely need to try it out! Just found your blog and I am a new follower! I bet that was delicious!! 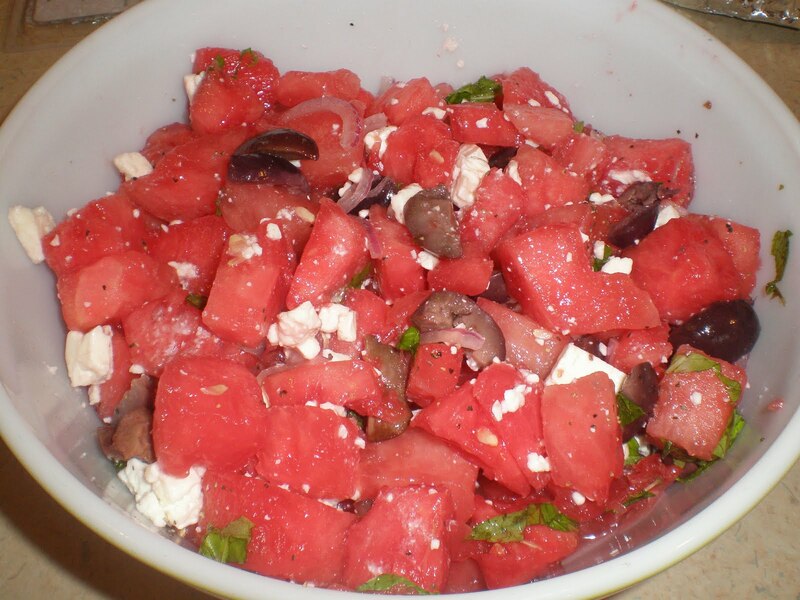 I do love feta and the tartness against that sweet watermelon must have been heaven!